← Like minded, blue water sailors together! When we were planning our first trip south of the BVIs a few years ago, we found it very difficult to get good information about the more southern areas of the Caribbean. Most of what I could find in the sailing magazines and online, was focused on the American and British Virgin Islands, so popular with the charter set on holiday. Chartering in those areas is fun but cruisers generally head further south. This lack of good information was a real problem for us, and finding information about the islands of Antigua and south, the area that had been described to me as “where the real Caribbean begins” was tough to find. As I consider plans for spending next winter in the Caribbean, the 2019/20 season, I have been thinking about some of the favorite places that we have visited, those harbors and Islands that stood out in our travels, and thought it would be fun to share some thoughts about the spots we particularly enjoyed. We visited many terrific islands and harbors in the last two years, so from time to time, I’ll be writing about the ones that we particularly enjoyed and share what makes them special to us. When I make the run from the US, I generally plan on making landfall in Antigua and it is from there that we make our way south before heading north and back to the US. As I asked around for advice on “favorite places” Bequia, in the Grenadines came up, over an over, as a must visit spot. And while going there is always fun, it was recommended that we head there for the Easter Regatta, three days or racing an special events. 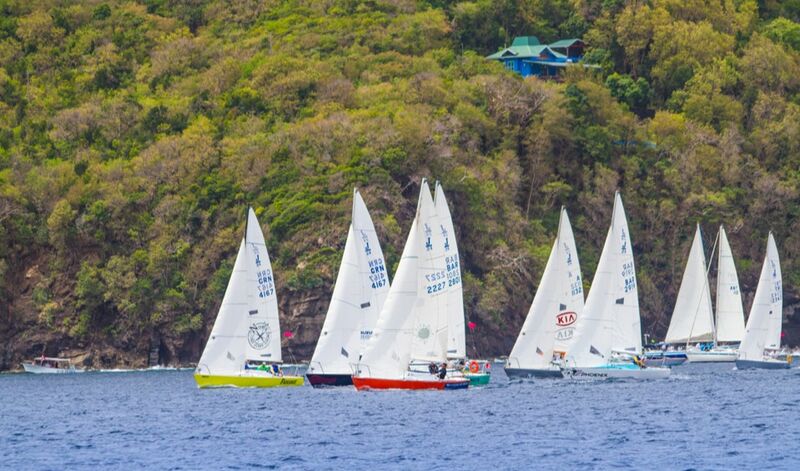 FYI, in 2019, the Bequia Regatta will take place from April 18th to the 22nd. It’s a very popular event with locals and cruisers a like with visitors coming from all over to enjoy all that’s going on and for many, to participate in the races. Boats of all shapes and sizes join in the three days of racing and parties. 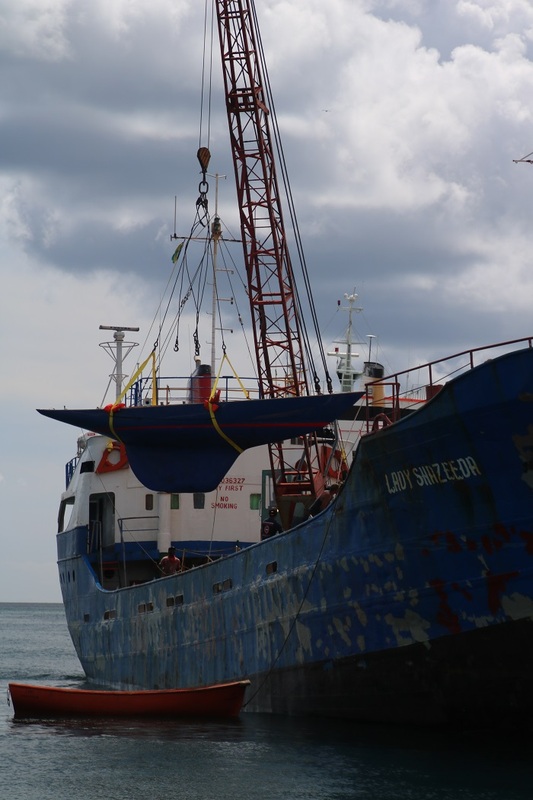 Some came under their own power and some on the decks of inter-island freighters. 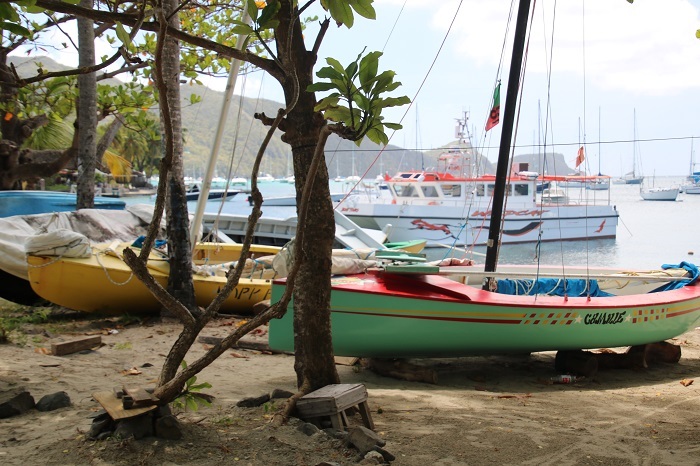 This regatta draws from nearby islands, including a number of Carriacou sloops, those beautiful traditional, beach built sloops like Exodus, the last boat of it’s type launched in 2013. It’s quite a sight to see her racing around the course with her cousins. Exodus was the subject of a full length movie about her building and the history of the design. Here’s a short trailer for the movie. Check it out. If that inspires you to watch the full movie, here you go. Get a glass of rum, sit down and enjoy the show. 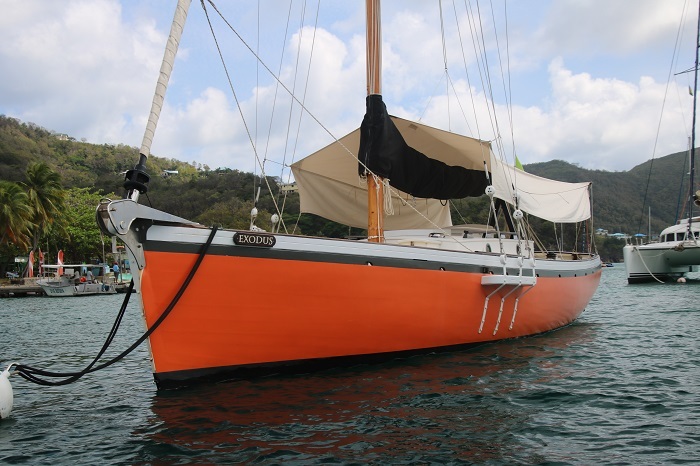 Others came from the US like this lovely schooner Heron. She summers in Maine, chartering out of Rockport. Brenda and I will be in Maine this summer and plan on spending time in Rockport ourselves. Perhaps we’ll see her. Her captain and owner also built her and he did a great job. Want to learn more about her? Follow this link to her home page. She’s really beautiful. While Heron is a classic design, she’s only a few years old. 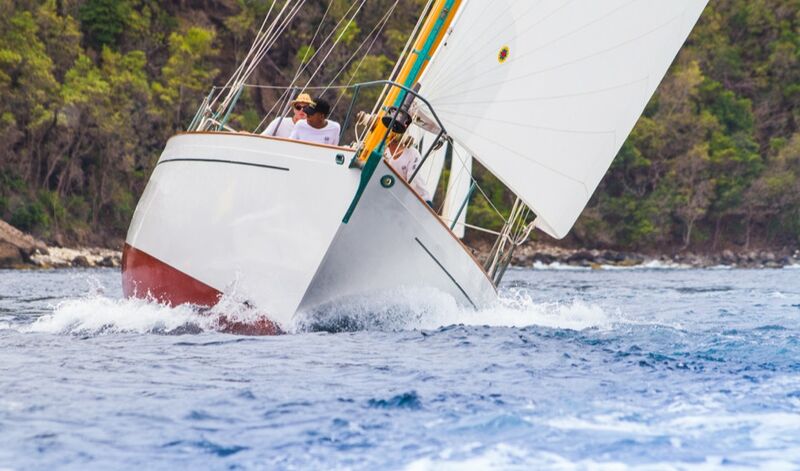 Other classics participate in the regatta as well as other events in the Caribbean, such as the Antigua Classic Yacht Regatta, held in late April in Antigua. One particular beauty that was there last winter was Ma Jong, built in the 1950s. I found this particular shot of her on the Easter Regatta home page. She’s a beautiful and very powerful boat. Her home port is Vineyard Haven on Martha’s Vineyard where she was restored to her present glory. I wrote about her last winter. There are some good sized one design fleets in the regatta, like these vintage J24 sloops. This colorful shot is also from the regatta site. 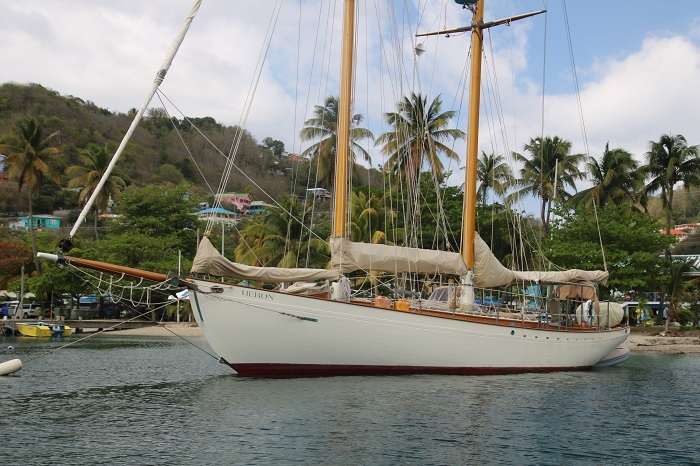 And, of course, there are the local Bequia sloops, built and raced on the island. 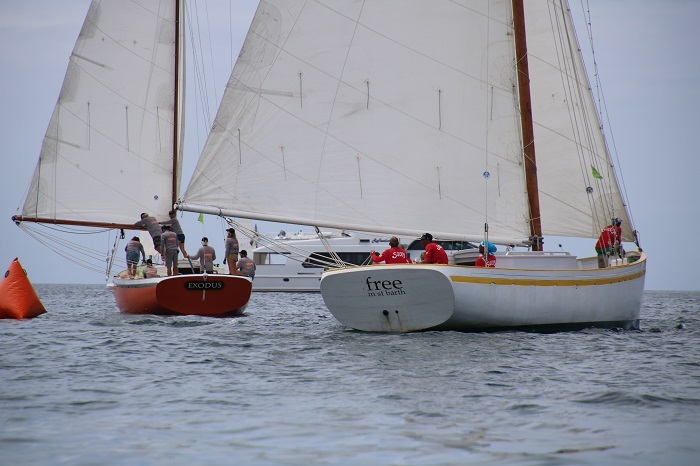 You don’t have to be there during the regatta to enjoy the fun as they tack around the harbor. The local youth are out sailing these boats nearly every day, regatta or not. 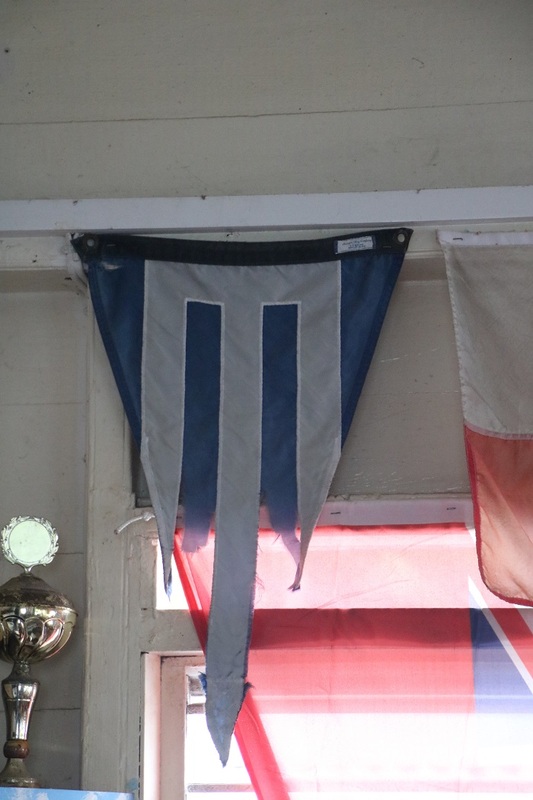 The youth clubhouse, oddly in a bar, is jammed with burgees brought by visitors over the years including this well used one from the Essex Yacht Club, my home club. 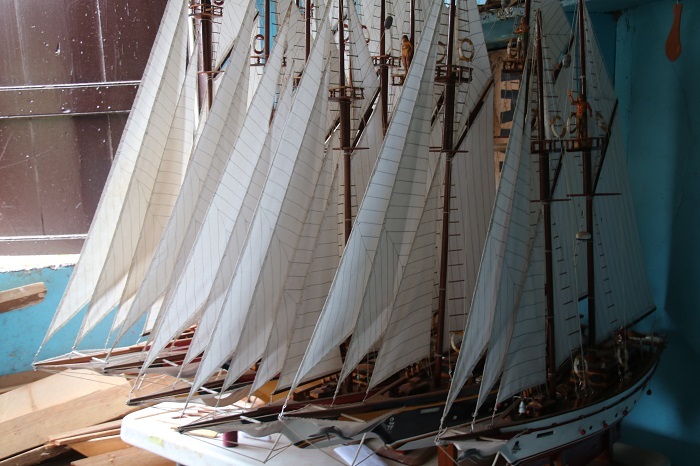 Along with boat building on the islands the history of fine craftsman goes way back including a tradition of model boats. These are fun to see and watch being built. I wrote about these models in this post last winter. If you followed the link above, you’ll find this photo a bit repetitive as that post also included discussion about the new dink chaps we had built. Anyway, we had some great work done on the dink. Pandora’s varnish below was freshened too. 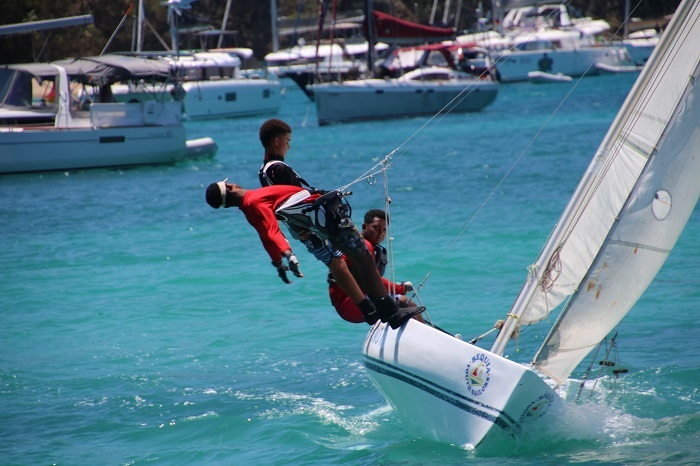 There’s plenty to do ashore during the regatta including all manner of competitions. Everything from musical chairs on stage to threading the needle, yes threading sewing needles. 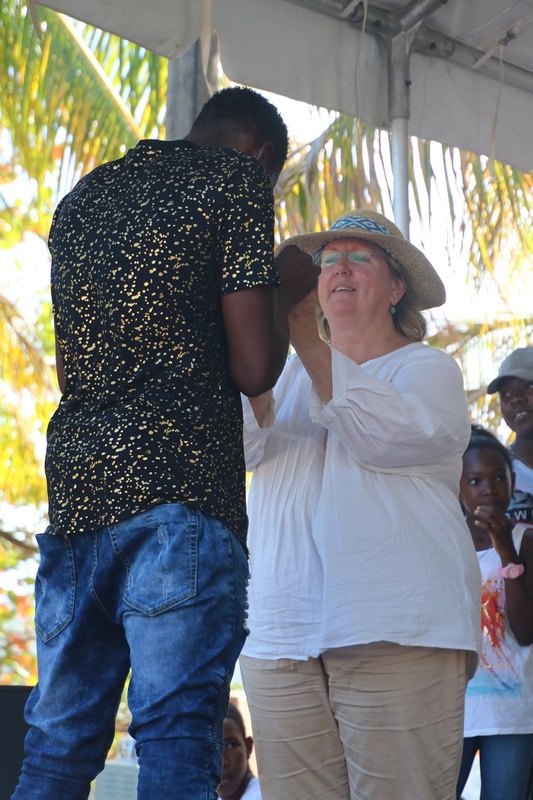 Brenda competed and won, with a little help from a local and no doubt mortified, young man. They were both good sports. Brenda’s favorite event was “crying for nothing” where contestants are judged on their ability to conjure tears and a sobbing cry on command. I believe that our two year old granddaughter Tori would do quite well in that event. 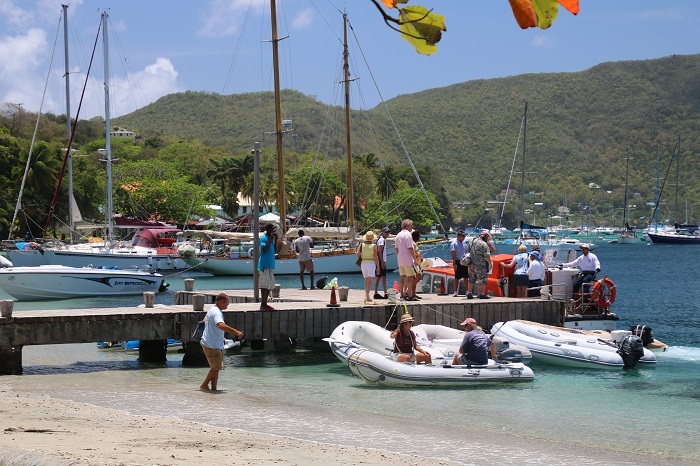 Checking into Bequia is easy if more expensive than the French islands. Just about all of the islands from St Vincent, south through the Grenadines, to just north of Grenada, are all part of the same jurisdiction. There’s a very good public landing at the head of the harbor and it can be busy during the regatta. The harbor is large with many moorings but, even during the regatta, there’s plenty of space to anchor. Nobody seems concerned about dinks speeding around the harbor so even getting back to your boat if it’s far out in the harbor is a fast trip. The harbor is well protected from any surge except in the outermost area. 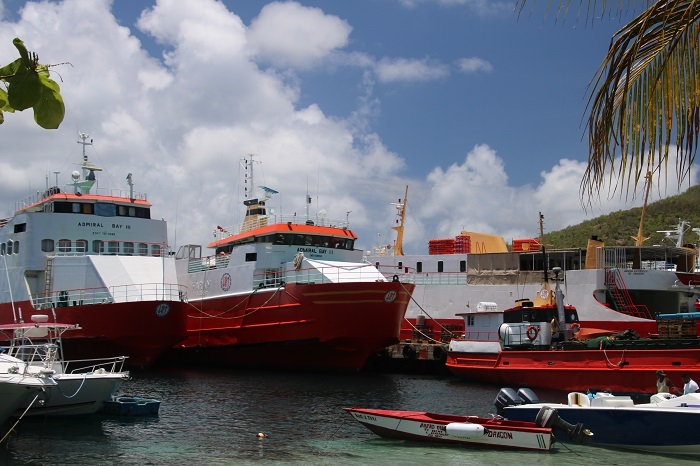 Everything about the harbor is colorful including the ferry boats from St Vincent. With all manner of local boats pulled up on the beach. We enjoy checking out local eateries and there are plenty to choose from, convenient from the walkway ringing the southern side of the harbor. I have used this shot before. To me, it perfectly evokes the image from the much loved classic book, The Wind in the Willows, when Ratty famously says, “Believe me, my young friend, there is nothing – absolutely nothing – half so much worth doing as simply messing about in boats.” Well, there you have it, Bequia, one of our favorite harbors and the Easter Regatta, one of our favorite events. This a place that you should include on your itinerary if you’re headed to the Caribbean. You won’t be disappointed. For more information on customs and immigration check out this official government link. Another good source of up to date information on clearing into the island and other useful information about visiting, check out Noonsite.com. 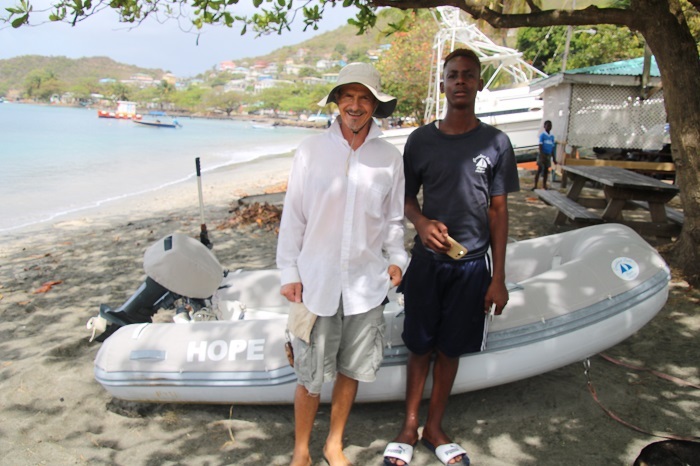 It’s worth nothing that while there is a problem with crime in nearby St Vincent, we found Bequia to be friendly and safe and didn’t hear of any particular problems from other cruisers. With regards to your dink, it’s recommended that you keep it locked up when ashore and out of the water and locked up at night. Good advice for just about any area in the Caribbean. 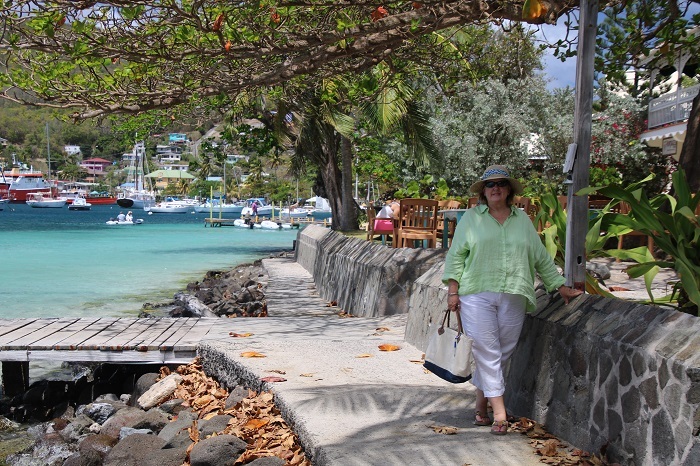 Now you can see why Bequia is one of Brenda’s and my favorite places. I’ll be writing about other favorites in the coming weeks and months, so stay tuned. Oh yeah, if you’ve signed up to get notifications when I post and aren’t getting them, you’re not alone. I have had difficulty with that function, I think it was the Russians, but Chris’s girlfriend Melody fixed it over the holidays so if you’d like to get a “ping” when I post, and I hope you do, sign up on the home page and then you’ll know. Yay, glad signing up for notifications is working! 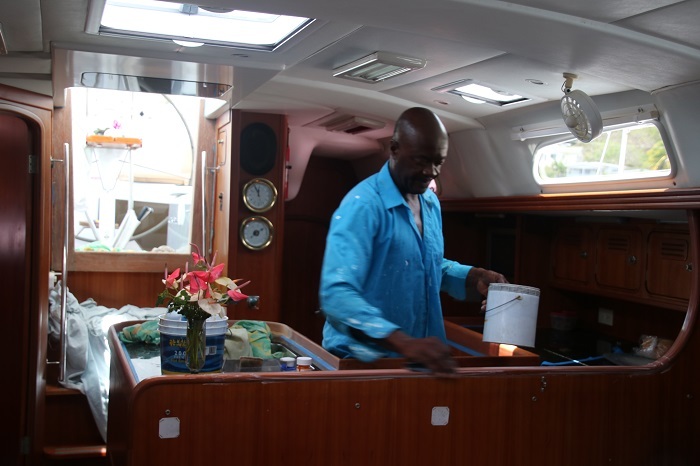 Heron is so lovely, and what a cool name Bequia is!